I am commuting with my bike recently, but my brakes were squeaking. I had to change the brake wires for new ones. Although we read a bike maintenance book it was difficult to understand. So we went to Our Community Bikes. 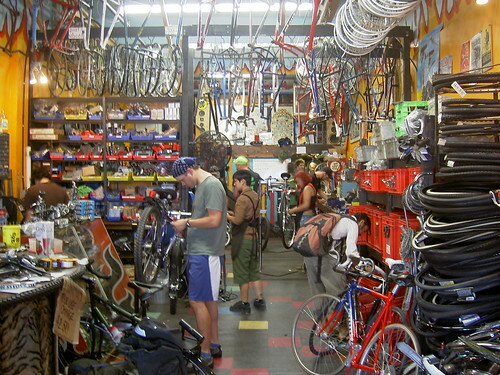 It’s a DIY bike repair shop run by a non profit organization called Pedal. All the repairing tools and parts are stocked, and funky chicks and dudes who are volunteers give us thorough advice. Their fee is $5/hour if you just use their tools, $10/hour if you use their tools and receive verbal instructions and $15/hour if you use their tools and receive hands on instructions. I used their tools and had verbal advice, bought break wires and cost me $14. Once I tried repairing it was very easy and I can do it by myself next time. 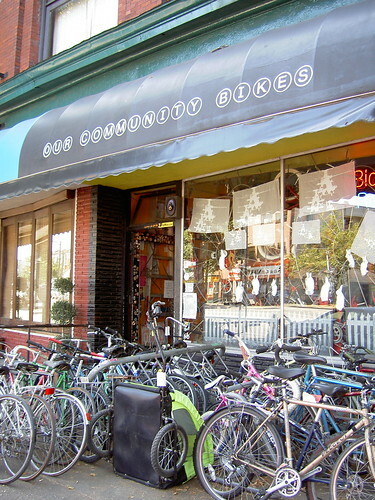 Our Community Bikes is engaged in improving and protecting environment by using more bicycles, recycling unwanted bicycles and give them to the people who want them, and training people to obtain skills to repair bikes. They also do a wonderful program where they train kids who want a bike for 5 weeks and they give a bike at the end of the program. If you have unwanted bikes or parts please donate them here. This entry was posted in Shop, Vancouver. Bookmark the permalink.